A Denver reporter showed up on set without first doing his research and ended up slinking off camera in embarrassment. 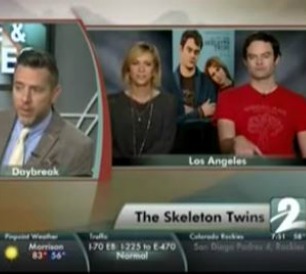 Kristen Wiig and Bill Hader, SNL alums and co-stars of the new movie The Skeleton Twins, appeared on a local station to be interviewed by Chris Parente. Clearly Parente never got away with not doing his homework in school because he gives away almost immediately that he has no clue what he’s talking about. The long-winded opening question literally ends with, “What is it?” But the dead giveaway was the question about Wiig being naked. Neither star is naked in The Skeleton Twins. Besides the fact that both sides should always be well-versed in the topic that they’re going to be talking about during an interview, it’s particularly critical when you’re going to be talking with someone who’s good at an ad lib. Wiig & Hader are sketch comedians and two of the funniest people in entertainment right now. There is little room for error from an interviewer. If anyone can come back from an unexpected turn of events and switch it into a laugh, it’s going to be them. But more than that, it’s a win for entertainers and whatever they’re promoting when something during the promo tour goes viral. Unlike days past when actors and musicians would show up at a TV show with scripted anecdotes and talking points, many now go to shows ready to go off-script, get playful and have fun. Take a look at just about anything that happens on Jimmy Fallon’s The Tonight Show. Or The Colbert Report. Just about every single stop on Chris Pratt’s tour for Guardians of the Galaxy was a viral moment. And there are a number of other examples from the past year alone where things just seemed to go a little off the rails and right into awesomeness. And so it happened with this interview. Well, awesome for Kristen Wiig, Bill Hader and all of us. Maybe Parente wasn’t too thrilled.